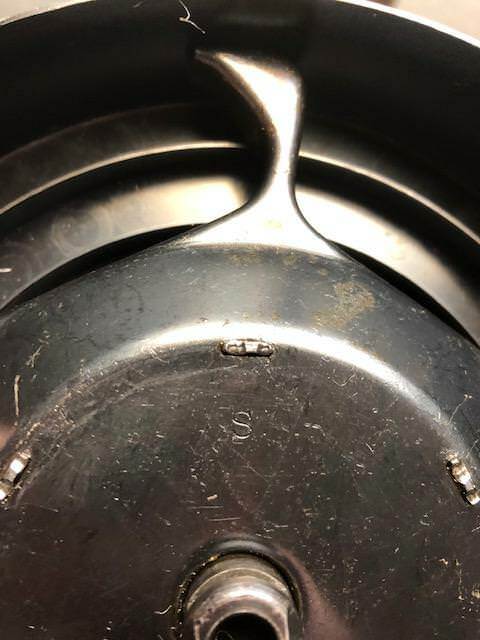 Value of WWII drum magazines? What is the typical value of a WWII L drum, like a Seymour? And did any of the WWII drum magazines have nickel rotors like many of the pre war drums? Thanks! Photos will help a lot. Ive seen asking pricing at $900-1200.Not sure if any have ever sold for close to that. .... And did any of the WWII drum magazines have nickel rotors like many of the pre war drums? Thanks! My opinion is probably not. Nickel was in short supply in the U.S. in the WII time frame. It was needed for high strength steel alloys used in war time materiel. The supply of nickel was so low that the silver content of the five cent U.S. coin (what we call a "nickel") from 1942-1945 was upped to 35% to adjust for reduced nickel content. Today, such vintage coins are valued by collectors for their subtle, dark visual tone more so than the melt down value. Note also, the coating used on the oil bottle for Thompson was changed from the pre-WWII nickel plating to a painted black crinkle coat (and later to a zinc plate on the cylindrical bottle). ETA: I'm going to adjust the above statements a bit. "American Thunder" on page 168 has a picture of an open Crosby drum with the annotation "Note nickel plated rotor typical of Crosby drums." On page 167, it is stated that production of drums by Crosby was began in July, 1940, and that all of the Crosby drums were made for Defense Aid contracts. Edited by Merry Ploughboy, 12 November 2018 - 02:23 PM. Good pricing info above. The WWll Crosby drums did have a "silvered" rotor. I never looked into what the purpose was. As noted by others above, the first run of Crosby drums did have silver-colored rotors. However, they do not appear to be the same as the ones encountered in pre-war drums. The appearance is different. I am not certain whether they have nickel content or not. The exterior of these drums were painted black, likely at the request of the Brits who ordered them. The second run of Crosby drums had a blued exterior and blued rotor. Before the Russian stuff started showing up, Nice WWII drums typically went for $700-$1,000. Then the market got flooded and the going price for most WWII drums dropped to $400-$500 for many years. We have seen an uptick in the past year and a half, but the prices seem to be settling back to that range. Do not be surprised to see asking prices in the $700-$800 range, but as others have noted, you can probably find them for less. The Crosby drums with silver rotors are an exception. They typically run $600-$800. Seymours and the United Specialties drums (versions 3-5), typically called Bridgeport drums, run around $400-$500. United Speciakties drums versions 1 & 2 are fairly rare and much more expensive, $800-$1300 if you can find them. WPS and Charles Fischer drums are extremely rare and very expensive. Prices are hard to quote since so few exist and change hands. I'd say good price, grab it. Understand that it is a mismatch. Most likely a Crosby rotor that was swapped in at some point. A Seymour drum will have a bright blued rotor with an S on it. We handled a hundred or so of the so called Russian drums that came in around 15 years ago. One day while going through them I thought I'd found a rare variant. Turned out to be a Seymour/Crosby mixed marriage. Is there any way to tell one nickeled rotor from another? Markings or otherwise? Looks like the Seymour has an S on the rotor - where is that found? Many thanks. Great info in this thread. It seems typical of the price I've seen over the last year or so for this type WWII drum in similar condition.